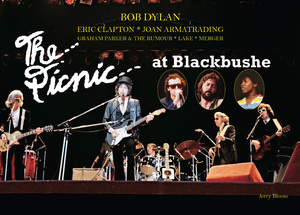 The Picnic At Blackbushe is a deluxe 128-page hardcase book in a metal flight case. Bob Dylan was experiencing a renewed commercial peak and had embarked upon a year-long world tour. The European leg included six nights at London’s 17,000 capacity Earl’s Court in early June that sold out in hours. Due to demand Goldsmith quickly organised the outdoor show that was dubbed The Picnic At Blackbushe which concluded the European leg of the tour. The line-up was augmented with Eric Clapton, Joan Armatrading and New Wave artist Graham Parker & The Rumour plus Lake and Merger. Demand was phenomenal and Dylan was reportedly paid a performance fee of £1 million. The largest for a single artist at that time and a staggering amount for 1978. With Dylan having not played the UK mainland for twelve years, his return to Britain was the event of the year. Anyone who was anyone made the effort to be there including New Wave artists such as John Cooper Clarke and members of the Clash and other musicians such as Ringo Starr and Barbara Dickson. Many other well known celebrities of the day also made the trip to Blackbushe including comedian Billy Connolly, actress Jenny Agutter and Bianca Jagger. Now you can relive the magic of Blackbushe in this stupendous limited edition coffee table style deluxe book. Crammed full of glorious, largely, previously unpublished colour photos of Dylan, Clapton, Armatrading and Parker, the book also covers each performance with memorabilia, stories, reviews, anecdotes and memories from the artists and audience alike.